Sorry if you saw an early version of this post yesterday. It got away from me before I managed to schedule the post time. The joys of computers. Anywho. Welcome back! For today's Growing in Unity projects, I used the fun "Halloween Greetings" set. LOVE the witchy gal! I've been wanting try coloring on kraft paper and I just picked up a small set of Derwent's "Inktense" pencils so this was the perfect opportunity. Of course, after doing a more muted card, I wanted to do a bright one also so there's card #2. Great withy cards! How do you like those Inktense pencils? They're on my wish list. Great cards! I've been hearing and reading alot about the Inktense pencils, did you like them? Your coloring looks great!! Love your 2 cards! I just got the same stamp recently and haven't inked it up yet! Your coloring looks great! Terrific paper choices and color combo too. Great job! I love that witch! Great coloring and designs, Jen. 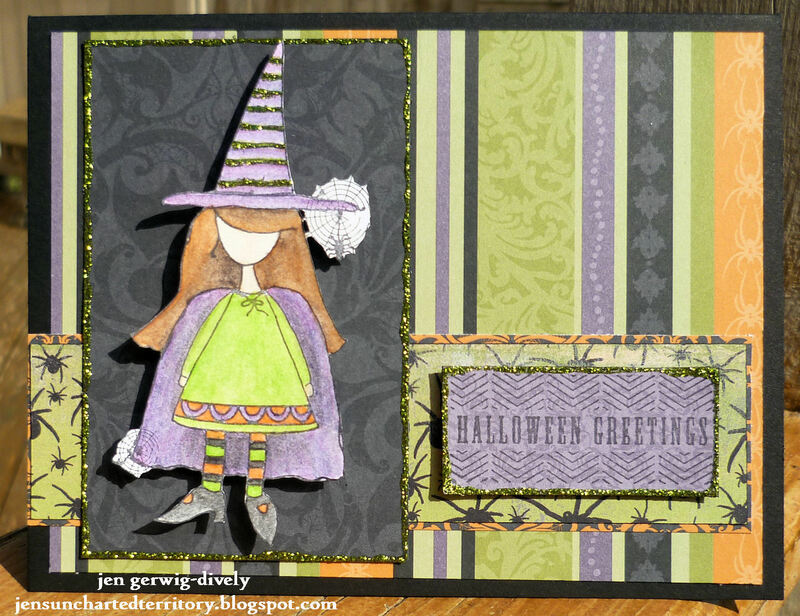 Really love how you did two versions of this adorable Halloween card! Really like how you're showing us two cards each day. Great coloring and fussy cutting on the image! Cute, cute, cute! 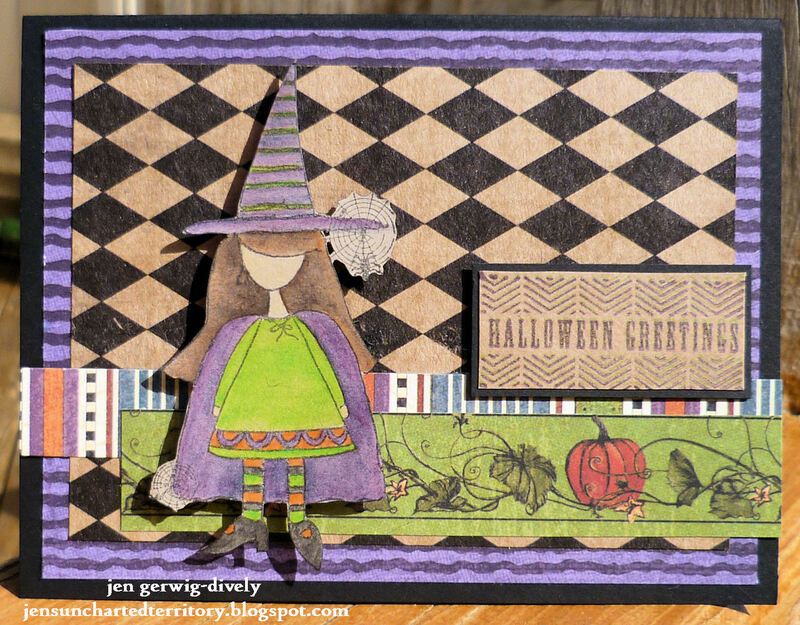 I just love Halloween cards! I just ordered this stamp...thanks for the inspiration! I LOVE purple and orange together. I had a dress in those colors when I was 8--I HAD to have it. It was "expensive", but my mom finally agreed. I LOVED it. Really cute cards and love the different backgrounds and colors. This little witch is anything but scarey! 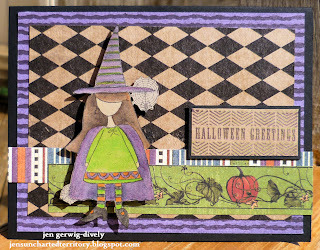 Cute Halloween cards! Been meaning to try the coloring on Kraft paper. Great coloring! OK... now you are making me want to start Halloween cards. Cute cards. Love your fun little Halloween cards! 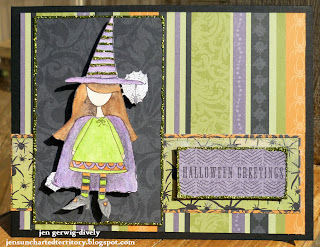 Cackling like a witch..she is adoreable..beautiful cards!